This saint was nobly born about the year 401, and was related to St. Honoratus of Arles, and of the same country in Gaul, which was probably Lorraine, or some other part of Austrasia. He was brought up in a manner suitable to his birth, in the study of the liberal arts, and of every branch of polite learning. especially of eloquence and philosophy. But how little value we ought to set on all things that appear great in the eyes of the world, he himself has taught us. "We are all equal," says he, "in Jesus Christ; and the highest degree of our nobility is to be of the number of the true servants of God. Neither science, nor birth, according to this world, can exalt us, but in proportion to our contempt of them." Before God had put these sentiments into his heart, he seems to have been not altogether insensible to the advantages of this world, in which he was raised to the highest dignities. His kinsman, St. Honoratus, who had forsaken his country to seek Christ in the solitude of the isle of Lerins, where he had founded a great monastery, was the instrument made use of by the Almighty to open his eyes. This holy man had always loved Hilary, and thought he could not give him more solid proof of his friendship than by endeavoring to gain him entirely to God. He therefore left his retirement for a few days to seek him out, and endeavored to move him by the same powerful, weighty reflections, which had made the deepest impression on his own mind, and induced him to break the chains of the world. "What floods of tears," says St. Hilary, "did this true friend shed to soften the hardness of my heart! How often did he embrace me with the most tender and compassionate affection, to obtain of me that I would take into serious consideration the salvation of my soul! Yet, by an unhappy victory, I still remained conqueror." Honoratus, finding his endeavors to wean him from the charms of a deceitful world ineffectual, had recourse to prayer, his ordinary refuge. "Well," said he to Hilary, "I will obtain of God, what you will not now grant me." Upon which they took leave of each other. Hilary, reflecting on what Honoratus had said to him, was not long before he began to feel a violent conflict within himself. "On one side," says he, "me-thought I saw the Lord calling me; on the other the world offering me its seducing charms and pleasures. How often did I embrace and reject, will and not will the same thing! But in the end Jesus Christ triumphed in me. And three days after Honoratus had left me, the mercy of God, solicited by his prayers, subdued my rebellious soul." He then went in person to seek St. Honoratus, and appeared before him as humble and tractable as the saint had left him haughty and indocile. From this moment there appeared in Hilary that wonderful change which the Holy Ghost produces in a soul which he truly converts. His words, looks, and whole comportment breathed nothing but humility, patience, sweetness, mortification, and charity. Every one saw in him a man who began to labor in earnest to save his soul, and who had put his hand to the plough to look no more behind him, or to send a single thought alter v. hat he had left for Christ's sake. Aspiring to perfection, he sold all his several estates to his brother, and distributed all the money accruing from the sale among the poor, and the most indigent monasteries. Thus disengaged from the world, and naked, no less in the inward disposition of soul than in his exterior, he, like Abraham, took leave of his own country, and made the best of his way to Lerins; where from his first entrance he made it appear that he was worthy to live in the company of saints. He set out in the pursuit of monastic perfection with such zeal and fervor, as to become in a short time the pattern of those on whose instructions and example he came to form his own conduct. His application to prayer and mortification, and his watchfulness and care to avoid the smallest faults and imperfections, prepared him to receive the gift of tears. It is thought that his baptism was posterior to his retirement. St. Honoratus having been chosen archbishop of Arles, in 426, Hilary followed him to that city; but it was not long before his love of solitude occasioned his return to Lerins. All the holy inhabitants of that isle testified as great joy to receive him again, as he felt to see himself among them. But God, who had other designs upon him, did not permit him to enjoy long his beloved retirement. St. Honoratus begged his assistance, and the comfort of his company, and as he did not yield to entreaties, went himself to fetch him from Lerins. Soon after God called St. Honoratus to himself, his death happening in 428 or 429. Hilary, though sensibly afflicted for the loss of such a friend, rejoiced however to see himself at liberty, and set out directly for Lerins. But no sooner were the citizens apprized of his departure, than messengers posted after him with such expedition, that he was overtaken, brought back, and consecrated archbishop, though only twenty-nine years of age. In this high station the virtues which he had acquired in solitude shone with lustre to mankind. The higher he was exalted by his dignity, the more did he humble himself beneath all others in his heart. He reduced himself in every thing to the strictest bounds of necessity: and he had only one coat for winter and summer. He applied himself diligently to meditation on the holy scriptures, and preaching the word of God, was assiduous in prayer, watching, and fasting. He had his hours also for manual labor, with a view of gaming something for the poor; choosing such work as he could join with reading or prayer. He travelled always on foot, and had attained to so perfect an evenness of temper, that his mind seemed never ruffled with the least emotion of anger. He had an admirable talent in preaching. When he spoke before the learned of the world, his elocution, his accent, his discourse, his action, were such as the greatest orators justly admired, but despaired ever to come up to. Yet when he instructed the illiterate, he changed his manner of address, and proportioned his instructions to the capacities of the most simple and ignorant, though always supporting the dignity of the divine word by a maimer and expression suitable to its majesty. He preached the truth in its purity, without flattering the great. He had often in private admonished a certain judge in the province of a criminal partiality in the administration of justice, but without effect. One day the magistrate came into the church, attended by his officers, while the saint was preaching. The holy bishop broke off his sermon on the spot, and gave his surprised audience for reason, that he who had so often neglected the advice he had given him for his salvation, was not worthy to partake of the nourishment of the divine word. the judge no sooner heard his reflection, but withdrew in confusion, and the saint resumed his discourse Observing one day that many went out of the church immediately after the reading of the gospel, just as he was going to preach, he prevailed with them to return, by saying: "You will not so easily get out of hell, if you are once unhappily fallen into its dungeons." He had such a love for the poor, that to have the more to bestow on them, he lived himself in the greatest poverty: he never kept a horse, and labored hard in digging and manuring the ground, though educated according to the dignity of his family. To redeem captives, he caused the church plate to be sold, not excepting the sacred vessels; making use of patens and chalices of glass ill the celebration of the divine mysteries. If his compassion for the corporal miseries of the faithful was so tender, we may judge how much more he was moved to pity at their spiritual necessities. He bore the weak with tenderness, but never indulged the passions or sloth of any. When he put any one in a course of penance he was himself bathed in tears; whereby he troth excited the penitent to the like, and with ardent sighs and prayer obtained for him of God the grace of compunction and pardon. He visited the bishops of his province, and endeavored to make them walk in the perfect spirit of Christ, the prince of pastors. He established many monasteries and took particular care to enforce a strict observance of monastic discipline among them. He had a close friendship with St. Germanus, whom he called his father, and respected as an apostle. He presided in the council of Ries in 439, in the first council of Orange in 441, in the council of Vaison in 442, and probably in 443, in the second council of Arles, in all which several canons of discipline were framed. His zeal exasperated several tepid persons; and some of these, by misconstruing his actions, gave the holy pope St. Leo a disadvantageous character of him. His zeal, indeed, had been on some occasions too hasty and precipitate: but this was owing in him to mistake, not to passion; for the circumstances of his actions, and of his eminent piety, oblige us to interpret his intention by the same spirit by which he governed himself in his whole conduct. This disagreement between St. Leo and St. Hilary proved a trial for the exercise of zeal in the former, and of patience in the latter, for his greater sanctification by humility, submission, and silence. 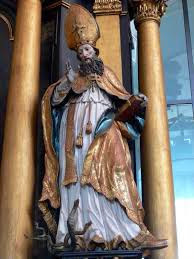 Chelidonius, bishop of Besancon, had been deposed by St. Hilary Upon an allegation, that, before he was consecrated bishop, he had married a widow, and had condemned persons to death as magistrate; both which were looked upon as irregularities or disqualifications for holy orders. Chelidonius hereupon set out for Rome, to justify himself to the pope, St. Leo, who received his appeal from his metropolitan, and acquitted him of the irregularity with which he stood charged. St. Hilary, upon hearing that his suffragan was gone for Rome, followed him thither on foot, and in the midst of winter. The pope having assembled a council to judge this affair, St. Hilary took his seat among the other bishops that composed it: but from his not attempting to prove the irregularity which had been alleged against Chelidonius, the saint seemed to own that he had been imposed on as to the matter of fact. But he pretended, that the cause ought not to be judged otherwise than by commissaries deputed by the pope to take cognizance of it in the country that gave it birth, a point for which some Africans had contended. This plea was overruled, the contrary having been frequently practiced, when both parties could appear at Rome: though the manner of judging appeals is only a point of discipline, which may vary in different places. Another affair brought St. Hilary into a greater difficulty. Projectus, a bishop of his province, being sick, St. Hilary, upon information, hastened to his see, and ordained a new bishop: after which Projectus recovering, there were two bishops contending for the same see, and Hilary supported the last ordained; perhaps because the first might remain disabled for his functions. The author of St. Hilary's life does not clear up his conduct in this particular: but we cannot doubt of the sincerity of his intention. Moreover the discipline of the church in such matters was not at that time so clearly settled by the canons as it has been since. St. Hilary therefore imagined a metropolitan might have a discretionary power in such matters. However St. Leo rightly judged such an ordination irregular, liable to great inconveniences, and productive of schisms. Wherefore he forbade St. Hilary to ordain any bishops for the future. Our holy prelate cancelled his mistakes by his patience, and St. Leo, writing immediately after the saint's death, to his successor Ravennus, calls him, <Hilary of holy memory>. Exhausted by austerities and labors, St. Hilary passed to a better life on the 5th of May, 449, being only forty-eight years old. St. Honoratus, the eloquent bishop of Marseilles, who has given us an abstract of his life, relates several miraculous cures wrought by the saint while he was living. His body lies in a subterraneous chapel, under the high altar, in the church of St. Honoratus at Arles, with an elegant ancient epitaph. The name of St. Hilary stands in the Roman Martyrology. That this saint never gave in to the Semi-Pelagian doctrine, though it hard not been then condemned by any decree of the pastors of the church, is clearly shown by Tillemont and Dom. Rivet. This is proved from several passages in his life by St. Honoratus; and in the Martyrologies of Rabanus and Notker it is mentioned that he vigorously exerted his zeal in bringing a light and in correcting the Pelagian heresy, which is taught in the conferences of Cassian. His exposition of the creed, commended by the ancients, is now lost: his homilies on all the feasts of the year were much esteemed, but are not known at present. The best edition of his works is given by John Salinas, regular canon of St. John Lateran, in Italy, in 1731.